Dave’s Computer Tips is working hard to bring top-quality software to our readers. Please note that none of the upcoming contests and giveaways are etched in stone. Changes may be made to this list at any time. The long-broken DCT Speed Test link has been fixed! You can now use it to check your Internet throughput between your computer and the Dave’s Computer Tips servers. You can use the Main Menu link at the top of the page, or use this Speed Test link to accomplish the same thing. Try it out! Congratulations to the Winners and Thank You to everyone who participated! Steganos has generously offered us five licenses for a giveaway contest. These Privacy Suite 20 licenses are currently valued at $59.95 (US), but you could win one for free just by entering this contest. This contest has ended, but you can read about it on this Steganos Privacy Suite 20 page. iBoysoft has graciously offered us five licenses for their Data Recovery program. These licenses are currently valued at $69.95 (US), but you can win a free copy by entering this giveaway contest. There is also a limited free version available at the above link. This giveaway contest is scheduled to begin on October 15 and run through October 25, 2018. Keep an eye open for this great deal!! 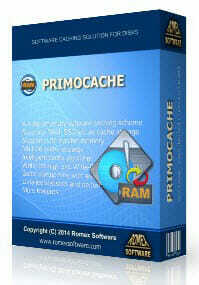 Romex has generously offered our DCT readers a chance to win one of three licenses for their PrimoCache software. These licenses are currently valued at $29.95, but you could win one for free just by entering this contest! Romex also offers a generous 60-day trial period so you can try it out before you buy! This contest is scheduled to begin on October 29 and will run through November 8, 2018. If you want to really speed up your computer, then don’t miss this great offer! Simply click the previous link, select to buy the product, and apply the code during checkout. This contest is scheduled to begin on November 12 and will run through November 22, 2018. This is a full-feature application and definitely worth your attention! That’s it for now. Be sure to visit often so you don’t miss these great Contests and Giveaways! And don’t forget, there are other informative and entertaining articles posted by our writers during the week as well. If you would like to see a specific piece of software promoted as a giveaway contest on DCT, please let us know and we will do our best to make that happen.